This week, NOAA hurricane experts will visit five U.S. Gulf Coast cities aboard a NOAA hurricane hunter aircraft to raise awareness about storm threats and the danger of being caught without a personal hurricane plan. The five-day tour begins today and advances NOAA's efforts to build a Weather-Ready Nation through outreach and effective communication on the steps necessary to prepare for a hurricane. National Hurricane Center Director Dr. Rick Knabb, along with senior hurricane specialist Daniel Brown and storm surge team leader Jamie Rhome, will travel with the NOAA crew when the aircraft visits Corpus Christi, Tex. ; Houston, Tex. ; New Orleans, La. ; Tallahassee, Fla.; and Tampa, Fla. 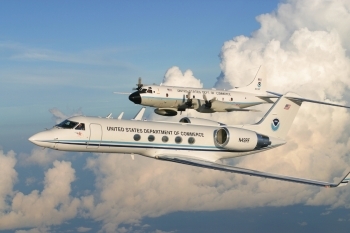 The hurricane hunter aircraft, also known as the NOAA WP-3D Orion turboprop aircraft, is used primarily by scientists on research missions to study various elements of a hurricane, flying through the eye of the storm several times each flight. The crew collects and transmits data by satellite directly to the National Hurricane Center so that forecasters can analyze and predict changes to the hurricane’s path and strength. The aircraft is part of our fleet of highly specialized research aircraft operated, managed and maintained by the NOAA Office of Marine and Aviation Operations. The aircraft is piloted by officers of the NOAA Corps — one of the seven uniformed services of the United States — and based at the NOAA Aircraft Operations Center, located at MacDill Air Force Base in Tampa, Fla.
Staff from local emergency management offices and the Federal Emergency Management Agency, non-profit organizations such as the American Red Cross and the Federal Alliance for Safe Homes, and several local NOAA National Weather Service forecast offices will be part of the team at each stop.